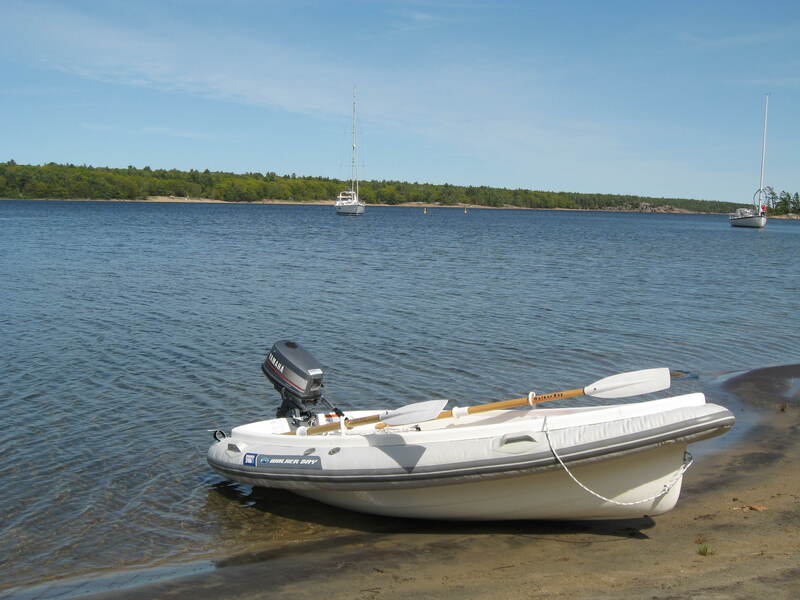 The Walker Bay dinghy was purchased at the Toronto Boat Show in 2009 for $2300. We’ve had many different dinghies before, including several inflatables but have never had much luck. So, we chose the Walker Bay because it look solid and was one piece. We wanted to put the dinghy on the davits, and that has worked out pretty well. The first year we had it, we actually kept the 4 horse Yamaha right on the dinghy and hoisted everything up onto the davits. That was ok but the second year (2010), we decided that we didn’t want to do this and Dennis removed the inflatable sides (for stability) and left them at home. He also stored the motor in the locker at the back of the big boat. We found that we really liked having the dinghy so lightweight. We found that we hardly ever put the motor on it, instead we just rowed around. 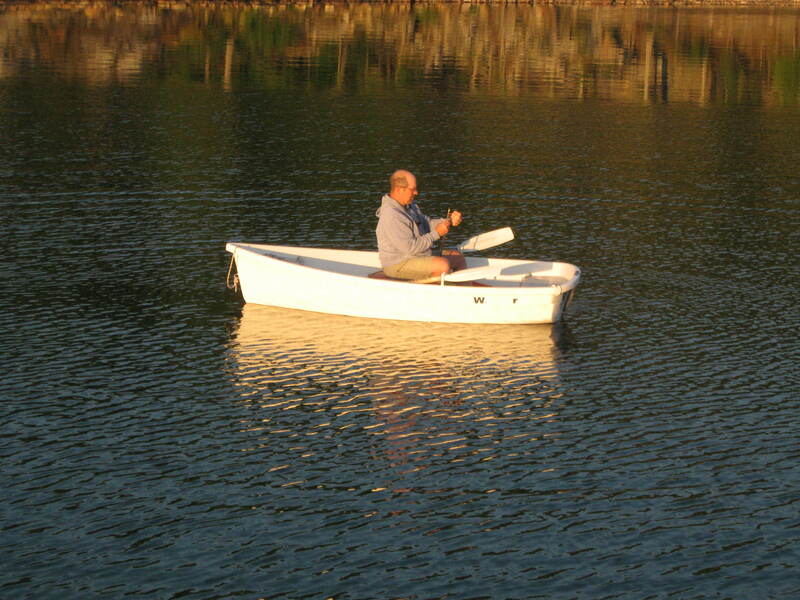 The dinghy was excellent to row – really fast and steady. And, hoisting it up on the davits was a breeze! Now, the dinghy has a self bailing mechanism which is absolutely useless! We thought that we had a defective one because the boat was constantly full of water. We ordered another bailer and it was no better. Our dinghy, within an hour of sitting in the water, would fill up and we were constantly bailing it out which defeats the purpose! We have a much simpler remedy now and the dinghy is nice and dry. Dennis bought a bathtub plug and before we put the boat in the water, we put the plug in! We met a couple of other people who had the same dinghy and one couple did not have this problem. 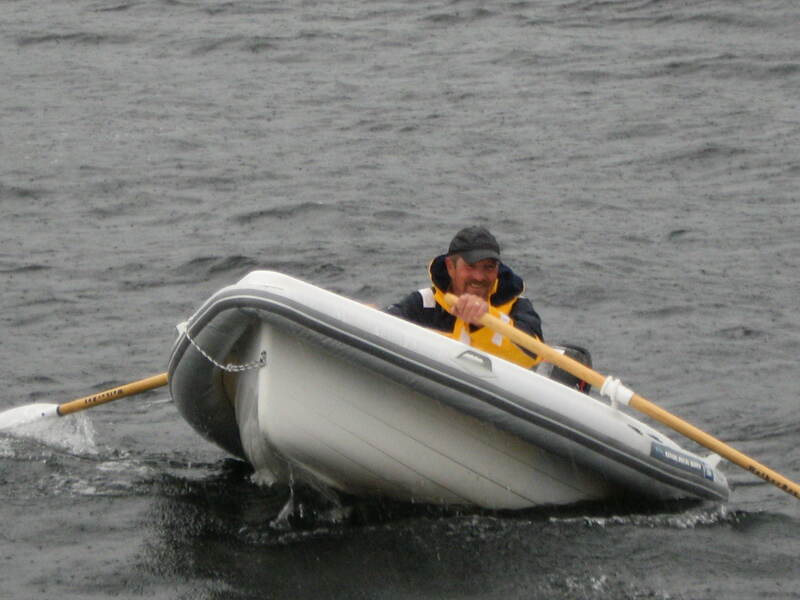 Their dinghy worked well but another man in Gore Bay did the same thing as we did – used a bathtub plug. So, I think the design of this mechanism could be improved. In all though, we really like the dinghy and will definitely use it this year again without the motor and without the inflatable stabilizers. We found that we really didn’t really need either one and it just made the dinghy heavier. Actually, one of the dinghy’s eyes broke – that is the piece that holds the dinghy to the line on the davits. The weather was very rough and it was bouncing around. Dennis bought a new eye and it is fine but he is always careful when he secures the dinghy to the davits – he doesn’t let it bounce around anymore. We’ve had enough disasters losing dinghies in stormy weather!